A car mechanic from Torpoint has been praised for his heroic acts after he pulled a motorist from a burning car. 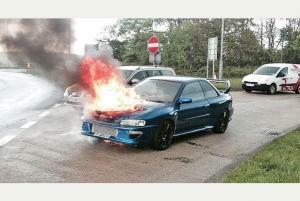 Scott Lintott had just spent thousands reconditioning his beloved Subaru Impreza and was driving it from a repair garage when it caught fire at Carminnow Cross. As he tried to free himself from the blaze he realised the doors were deadlocked and the windows would not open. Luckily mechanic Steve Bryant, who had been driving behind Mr Lintott, saw the fire start and came to the rescue, forcing a door open and dragging the driver to safety. Mr Bryant risked serious injury by coming to the Subaru owner's aid. And while a combined motor trade insurance policy can help protect a car mechanic against most of the risks they face in the workplace, there is no such cover for someone running into a ball of flames as they drive their white van home. Mr Lintott reflecting on the incident by saying: "It was terrifying and I was lucky to get out alive." Alarmingly, while the driver was trapped in the burning car some passersby actually stopped to take a photo, before the mechanic thankfully entered the fray. "I can't bear to think what would have happened to me if it wasn't for this person who came to help me. It was a total nightmare and in the end I was just so relieved to get home to my family," Mr Lintott said. He added: "I'd like to meet this person, because there is no doubt he saved my life."